The gap between the frame and rough stud opening must be insulated. It is important to use products that will easily fill the gap without creating any stress on the frame. When properly applied, low expanding polyurethane foam is well suited to the job because it will expand to fill all cracks and crevices without applying excessive force on the frame. After the foam is dry, it can be cut off to be flush with both the interior and exterior wall surfaces. If fibre insulation is used, do not compact the product too tightly or it will lose its effectiveness as insulation. 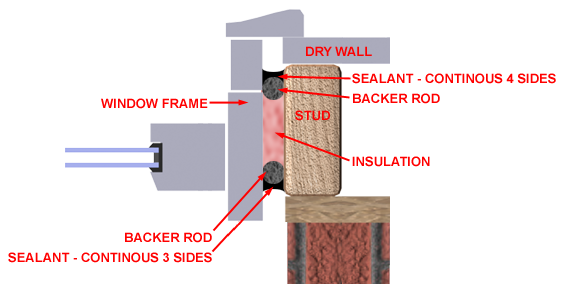 Always use a backer rod and caulking to seal the insulated space. Reconfirm that the unit continues to be square, level and plumb, fully operational and not twisted or warped.